Homeowners know that keeping surfaces in their home free from dust and soil is an everyday task, but often their upholstery is overlooked. 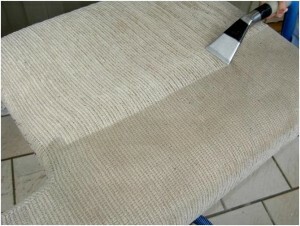 To preserve the fabric’s color, appearance, and texture, upholstery cleaning should be attended to on a regular basis. In addition to routine vacuuming and immediate attention to spills, periodic cleaning by a professional at Freedom® every one to three years will extend the life of furniture, as well as help to maintain a clean and healthy indoor environment. ~ Brush down furniture lightly with a fabric brush as often as you dust the rest of your home. ~ Alternatively, you can use the brush attachment on a vacuum. ~ While it might be easy to throw out your old stained t-shirt and buy a new one, drapes and furniture are an investment of hundreds to thousands of dollars, and the right maintenance will help them last as long as possible. To keep a healthy, clean indoor environment, upholstery cleaning should not be overlooked. Whether you’ve just bought new furniture or are looking to maintain their appearance and quality, be sure to add upholstery cleaning to your routine housekeeping. Finally, to keep your upholstery looking like new, schedule regular visits with a Freedom professional today.